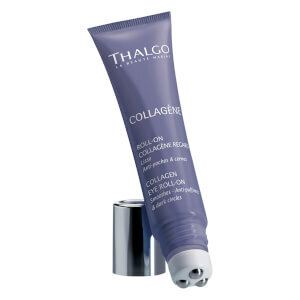 Revive tired, weary eyes with Thalgo Collagen Eye Roll-On, a smoothing formula that helps to diminish signs of ageing and fatigue around the delicate eye area. Cooling on contact, the roller packaging is equipped with a three metal ball delivery system that glides onto skin with a massaging, ice-cube effect. This, combined with a host of smoothing, anti-dark circle ingredients helps to reduce the look of puffiness and under-eye shadows. Its dose of Native Marine Collagen moisturises and smoothens the appearance of wrinkles and fine lines, while Yeast extract and controlled-release Caffeine tackle dark circles and puffiness. After use, eyes appear energised and revived. Apply morning and/or evening to skin around the eyes, working from the inner to the outer corners of the eyes, then from the temples towards the brow bones. Help absorption of any excess product with light tapping motions. Effectiveness is further improved if the product is kept in the refrigerator. Can be used on the go: apply throughout the day, even over makeup, whenever you want to counteract the effects of fatigue.